RMC’s women’s basketball team honor veterans with a game against Carroll College. Photo by Deja Nicole. 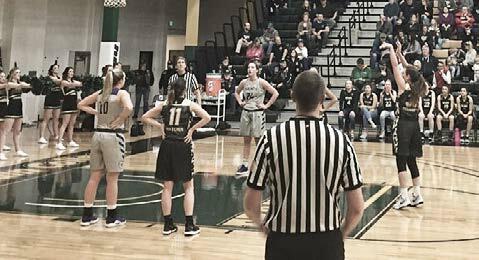 On Thursday, Jan. 17, the Rocky Mountain College Battlin’ Bears basketball teams played against Carroll College on Military Appreciation Night. The event celebrated all military personnel past and present, and specifically honored veterans killed in action and soldiers who lost their lives battling post-traumatic stress disorder. The women’s basketball team played at 5:30 p.m. On their jerseys were names of veterans who were killed in action. With these names on their backs, the women felt this game was more important in its own way. The men’s basketball team played at 7:30 p.m. Their jerseys carried the names of soldiers who lost their battle with PTSD. Andrew Shiffer, a veteran and president of RMC’s Veteran’s Club, helped make the event a success. Shiffer stated this event was “more of a military appreciation event with a basketball game added into it,” which explains the fans’ enthusiastic applause during the National Anthem and Color Guard presentation and the players’ desire to honor military personnel. Montana has one of the highest veteran suicide rates in the nation. Rocky’s Military Appreciation event was intended to spread awareness in order to bring not just Montana’s, but all veteran suicide rates down. “We want to tell their loved one’s story just as much as we want to tell a KIA’s [killed in action] because one momentary lapse in judgment doesn’t define a military career,” said Shiffer. Throughout the night, various resources were made available to veterans, students, and the general public. Booths were set up around he indoor track by organizations like the Vet Center and Montana Veteran’s Meat Locker. These resources were available for all veterans to go and check out. The women’s team won against Carroll 59-55 while the men’s team lost 50-69. Both basketball games were well played and the Battlin’ Bears fought well. In the end, however, these games were about more than basketball: they were about the people who have fought and those who have fallen for this country, and Rocky would like to continue recognizing them. For students who are interested in joining the Army Reserve Officers’ Training Corps (ROTC), please contact CPT Rob Allinson at robert.allinson@msubillings.edu. For those interested in learning more about the Veteran’s Club, please contact Andrew Shiffer at andrew.shiffer@rocky.edu.